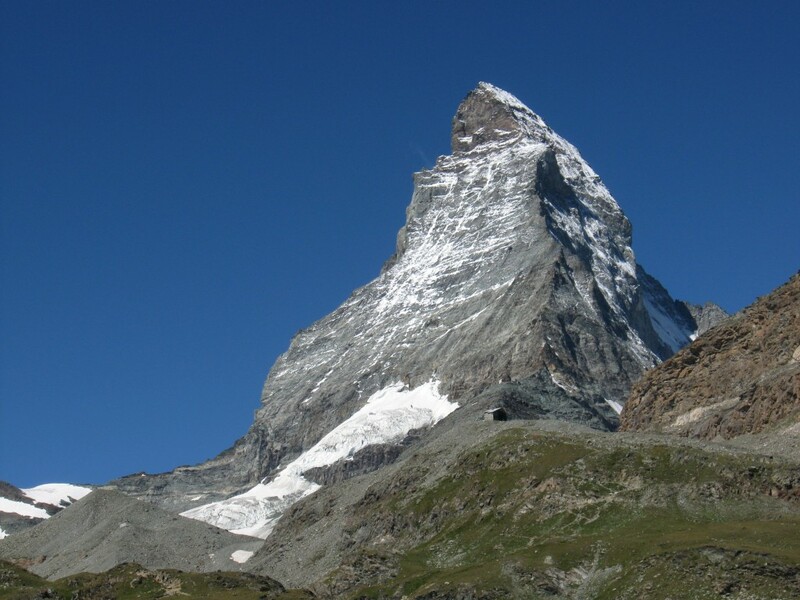 Home - Mountaineering - Alpine Mountaineering Trips - Climb the Matterhorn - Trip Itinerary – 7 Day Matterhorn Tour & climb. 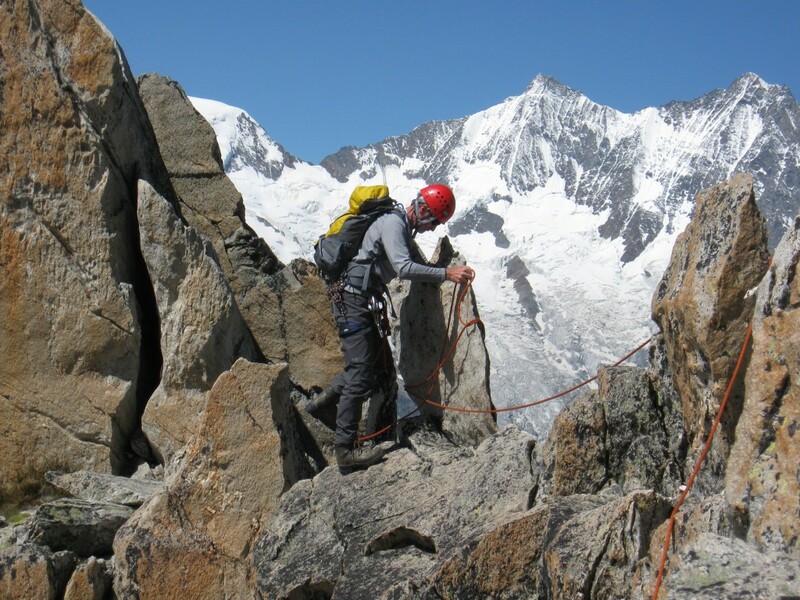 This tour combines enough training and peak ascent to prepare the participant not only for the Matterhorn, but for many years of successful alpine climbs. Training includes rock, snow and ice techniques, risk management, route finding. This tour blends instruction, application and fun. This is the kind of balance that bring success. Day 1: Meet in Saas Almagell or Saas Fee. Review gear, condition. Hike up to Almageller hut, review rope management, Belaying, knots. Day 2: Rock climbing on Dri Hornli. Great ridge traverse offering all aspect of alpine climbing. Continue to review techniques, belaying, rappelling, communication, down climbing. Day 3: Ascent of Portjentgrat. A mixed climb of: rock, snow. This long ridge is a thru test for the Matterhorn providing expose section, technical section, it is shorter then the Matterhorn and has an escape if necessary half way. Day 5: Active Rest day. Descent the via Ferrata in the Gorner gorge ( 3 hours of fun) or Ascent of Riffelhorn ( rock climb near Gornergrat). Day 6: Hike to Hornli hut. Reconnaissance of the bottom part of the Matterhorn that we will climb in the dark the next day. Day 7: Matterhorn Ascent, Along beautiful day. Weaking up at 3:00 am it is a 10 to 12 hours day of interesting climbing to an awesome peak.Return to Zermatt. This tour require strong physical condition and previous mountaineering experience. Tour for bigger group can be easily organize, but the Matterhorn ascent remain with 1:1 ration. Extra guides will join the group just for the ascent. Note: I recommend that you arrive one or two days prior to the beginning of the trip. To rest, take some hikes and acclimatize. Saas Almagell is situated in the Saas Valley not far from Saas Fee. I recommend that you stay in Saas Fee. *This tour combines enough training and peak ascent to prepare the participant not only for the Matterhorn, but for many years of successful alpine climbs. Training includes rock, snow and ice techniques, risk management, route finding. This tour blends instruction, application and fun. This is the kind of balance that bring success.